A friend of mine has a cabin in northern Minnesota. He likes to go ice fishing, but his place is a long way from a bait store, so he buys one or two weeks' worth of bait (minnows) at a time. He has a hard time keeping these minnows alive. If he leaves them outside, they freeze. If he brings them inside, they get too warm and die. It's a big problem for him in the winter, so MAE designed a product that can help. What's needed is a heater that will keep the minnows from freezing while not letting the water get too warm. My friend is off grid, so his power is mostly from 12 V batteries. Inexpensive aquarium heaters run off of 110 V AC and warm up the water to 80°F. This is too hot for minnows as they do best at around 50°F. So, what's needed is a heater that runs off of 12 V DC and only heats the water to 50°F. That's what this bait heater will do. A picture of the bait heater is shown below. The heater is designed to heat water to 50°F with the primary purpose of keeping fishing bait (minnows) alive during winter months. It runs off of a 12 V DC battery and will draw about 2.4 Amps or 30 Watts from the battery when heating. Warning: REV A does not have reverse polarity protection, so make sure you don't connect it backwards! 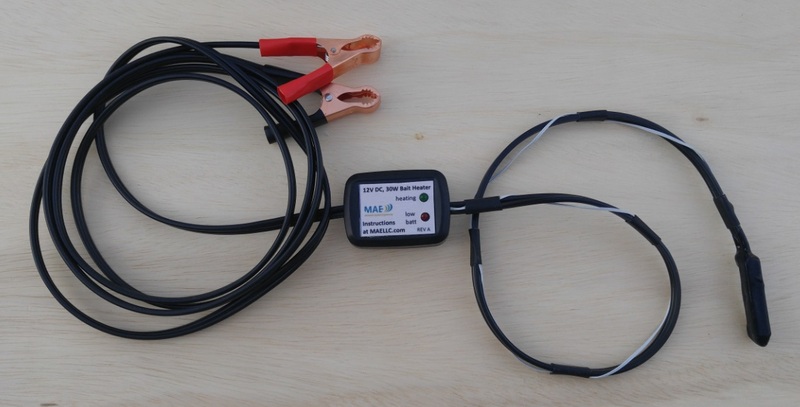 While the heater was designed to run off of a 12 V DC battery, there is an optional configuration that allows you to run it off of a 12 V external power supply that plugs into 110 V AC power. This is shown below. The heater element is designed to be submerged in water. When in the water, the water will conduct the heat away and keep it cool. You may not even be able to feel any heat coming from it, but the device is actively heating the water. 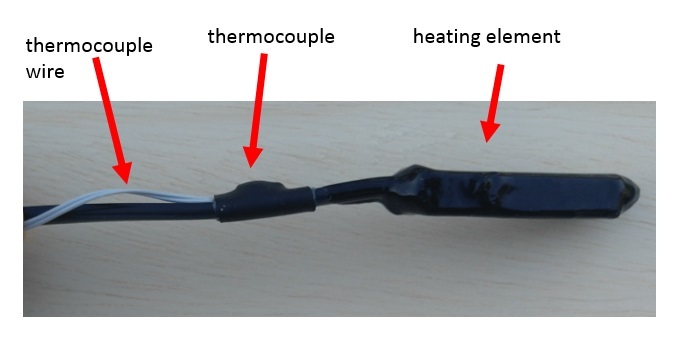 There is a thermocouple (sensor) about 1 Â½ inches away from the heater. When the water temperature gets to above 50°F, the heater will turn off. Only connect the heater to a 12 V power source when the heating element is submerged in water. If the heater element is taken out of water and placed in an environment colder than 50°F (such as outside on the snow in the winter time! ), the heater will turn on causing the heating element to become extremely hot. Hot enough to burn you, so be careful. When the heater is inside a heated room, the ambient temperature will be above 50°F and the heater won't turn on, so you may get used to the heater being cool even if it's not in water. Don't! For safety, disconnect the bait heater from the battery when the heater element is not submerged in water. If you're outside and take the heater element out of the water and place it on the snow, it will become extremely hot. The heating element should survive getting hot, but you run the risk of hurting yourself or some equipment that you may rest the heating element on. And if you place a hot heating element back in freezing cold water, you run the risk of it shattering due to the thermal shock. Be smart about using it. The bait heater has 10 Â½ feet of cable, 8 from the battery to the controller and 2 Â½ from the controller to the heating element. When heating, about 2.4 Amps flows through the cable and will cause a voltage drop of about 0.2 V at the controller. For REV A, the red light will turn on at a voltage of 12.0 V, which corresponds to a battery voltage of about 12.2 V indicating that the battery should be recharged. So, when the heater is turned off, the voltage at the controller will go up and may cause the red light to turn off. A close-up of the heating element is shown in the picture below. About 1 Â½ inches away from the heating element is a thermocouple. When the thermocouple is below 50°F, the heating element will be turned on, and it'll turn off when the temperature is above 50 F.
Unfortunately, a good solution for the wire that runs to the thermocouple couldn't be found, so a thin gray wire was wrapped around the main heater power wire. It's held in place with heatshink bands about every 6 inches. Care must be taken to ensure this wire isn't broken. If it is broken, the controller will detect this and not turn the heater on. The bait heater is meant to be used inside of a water filled cooler that's housing the bait (minnows). 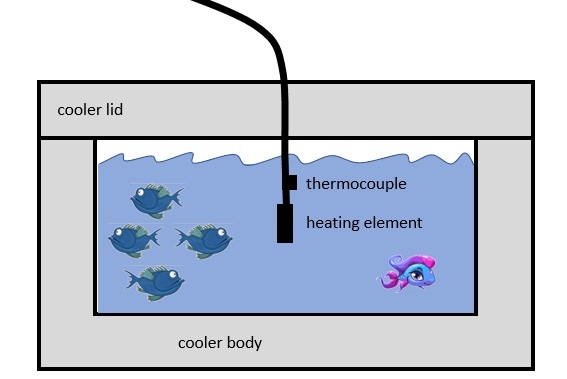 The 30 Watts generated by the heater should keep the water from freezing down to a temperature of 0°F; however, a high quality cooler should be used. The better the cooler, the less heat will leak out, and the lower the outside temperature can be before the water freezes. If the temperature drops below 0°F, ice can be expected to start forming around the edges and top, but there will still be some liquid water in the cooler. If the weather gets a lot colder than this, then a second bait heater will be required. For mounting the bait heater, it's best to drill a hole through the cooler lid and suspend the bait heater down into the water with the thermocouple just below the water line. This is sketched in the figure below. The hole should be filled with a sealant such as a Latex caulk to ensure that heat doesn't leave through the hole. Silicone doesn't stick to smooth surfaces nearly as well as a Latex based sealer and isn't recommended. Since ice forms on the top of the water, having the thermocouple near the surface will ensure that the heater is continuously on if the water starts to freeze. Placing a bubbler in the cooler will keep the water agitated, spreading the heat around the cooler and reducing the chance for ice to form. opening the cooler lid. If you expect to be opening and closing the lid a lot, it is probably best to bring the bait heater in through the side of the cooler. Bringing the heater in through the lid is best if you just want to store the bait, but if you want easily get bait from the cooler, a side wall entrance is best. Note that if you do go in through the side, it's best to have the hole for the bait heater above the waterline so water can't leak through the holes. Chances are you're going to be running the bait heater off of a 12 V battery. It's best to use deep cycle batteries as they can be discharged to a lower voltage than a regular car battery without damaging them. However, it's not good for batteries to discharge too far, even deep cycle batteries. The farther you discharge a battery, the fewer re-charges you'll get from it. 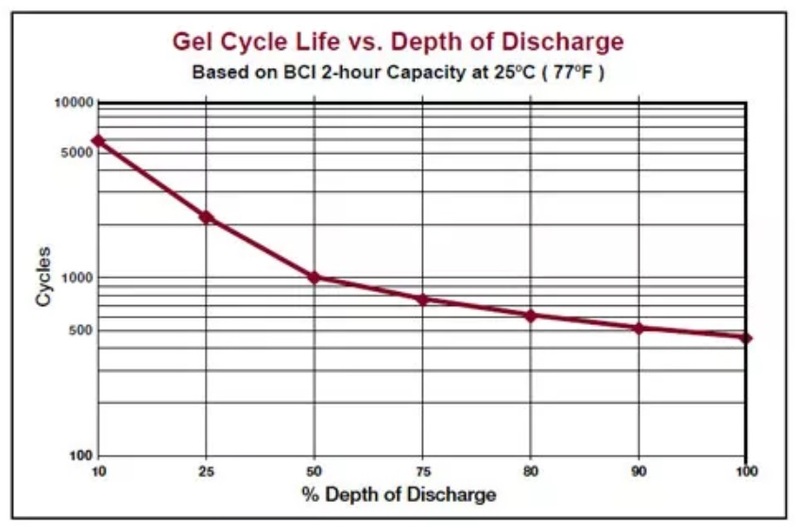 The graphs below show information about the number of recharge cycles you can (hope) to get vs. the Depth of Discharge (DOD). The farther you consistently discharge the battery, the less life you'll get from it. 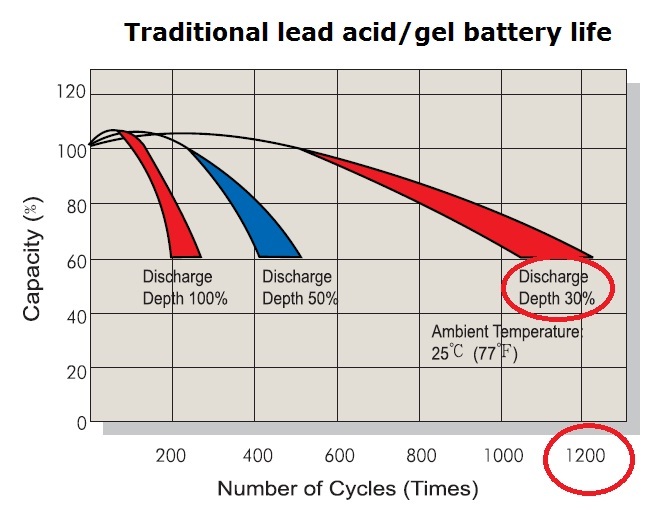 So, if you have a lead-acid battery, you only want to discharge it down to about 12.2 V. This is why the bait heater's red light will turn on when the battery is at 12.2 V during heating. As stated previously, when heating, there is about a 0.2V drop in the 8 foot power cable due to the large 2.4 Amp current draw. 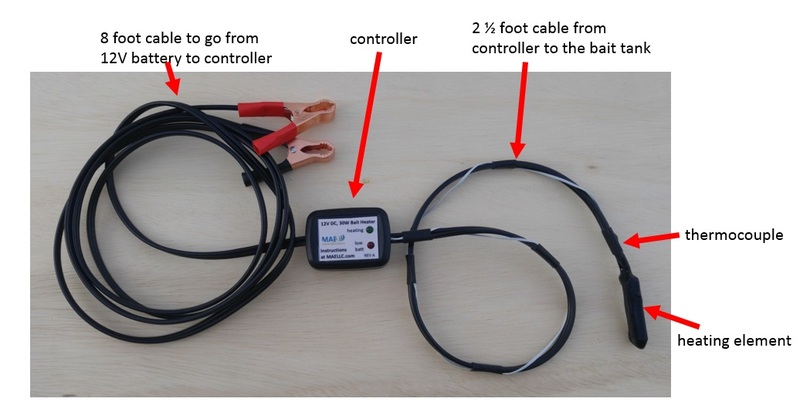 To compensate for this, the red light turns on when the controller voltage is 12.0 V. When the bait heater turns off, the large current draw stops and the voltage at the controller increases. So it's possible that the red low battery indicator turns on during heating (as indicated by the green light), and turns off when not heating (green light is off). Do you want a bait heater?